Update 3/29/2014: The offer is no longer available. Hotel Tonight is a hotel booking app that searches for hotel deals and can be great for last minute travel. Currently you can get an easy $56 in free credit using a new promo code, but it may not last long so be sure to grab it before its gone! 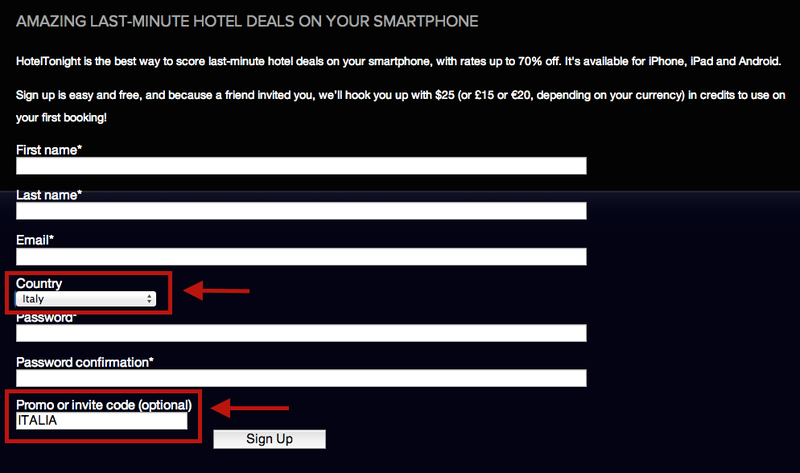 New users can get $56 free Hotel Tonights credit to use at any hotel when booking a hotel using the app. You can create a new account be using a different account if you already have an existing one. You can read more on this Slick Deals thread, but I just signed-up and it is still working. This offer is not eligible for stacking with a referral, but it’s better than the $25 normally offered when using someones referral code. Sign-up for a new Hotel Tonight account here. Enter your information and select ‘Italy‘ as your country. Apply promo code ‘ITALIA‘ for a free 40 Euros or $56 USD credit. Now all you have to do is download the Hotel Tonight app on your smartphone or iPad. 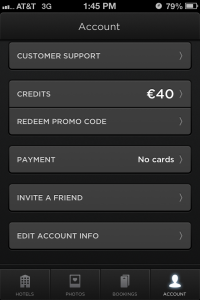 After you sign-in you will see the 40 Euro credit in your account. If you need to change the currency back to USD, you can find it under ‘Settings’. The 40 Euros posted immediately to my account after I logged into my account on my iPhone. I’ve had the Hotel Tonight app for a while now, but haven’t used it extensively—from the looks of it the app looks simple and easy to use to find low priced and last minute hotel rooms. Using the $56 USD credit will be a great way to try it out! Have you used Hotel Tonight? Can you find good deals? Let me know in the comments! ZYOUSSEF gave me $45 OFF! Try JBLAZEK11. It works for me. Thanks for the tip. Got in on this last night and shared with my family. Looks like the promo code has now expired. Haven’t had a chance to use HotelTonight before so looking forward to using these credits while in England. Congrats! I’m looking forward to trying out the app as well. Thanks, looks like it went dead this AM, now the post is updated.